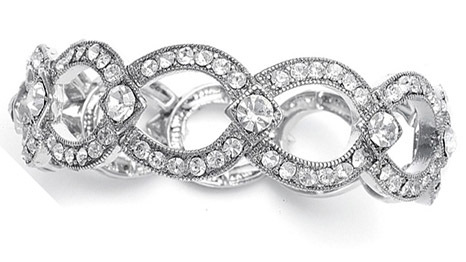 * Mariell's best-selling stretch bridal bracelet evokes the stylish fashion of the Art Deco period. * This silver rhodium plated bracelet with finely inlaid crystals will add a brilliant accent to your wedding gown or special occasion dress. * This sophisticated 7" bracelet measures 3/4" w.